Long post about releases ahead, brace yourselves! Last week we released KDE Applications and KDE Platform 4.14. KDE Applications, KDE Platform and KDE Workspaces were sometimes collectively referred as the "KDE Software Compilation" or "KDE SC" in short form, which is arguably a bad name, but it is what it is. The "Software Compilation" started dying a while ago and 4.14 marks its end. KDE Platform was 'virtually frozen' a long time ago, but we kept increasing the version number for some reasons that are now not important, so KDE Platform 4.14.x will be the last version, of course we will go to very high 'x' if there is bugfixes to be done. KDE Frameworks 5 is the successor of KDE Platform based on Qt5, it's already on 5.1 and the team plans to release a new 5.x version with both features and bugfixes every month. KDE Workspaces was frozen at 4.11.x, in fact if you check your distro, you are probably using 4.11.somehighnumber, the plan is to keep doing releases for at least a year if there are bugfixes available. Plasma 5 is the successor of KDE Workspaces based on KF5, it's currently at 5.0.1. The team plans releasing a stable 5.x.y version every month with bugfixes and a 5.x+1 feature release every three months. That leaves us with the third component of the old releases, "KDE Applications", comprised of more than 100 applications. We want those to move to Qt5 and KF5 since it's simply a better world, but we're not going to do it all at once as we did in 4.0. We will give the maintainers the choice to move as they feel the quality of their KF5 port is good enough. KDE Applications has been having feature releases every four months, with bugfix releases in the three months in between. We don't plan changing that, but to highlight that applications can be used independently of the libraries used to build the desktop you are using, we're just going to use a time approach for version numbers, that is, next release will be "KDE Applications 14.12"
And that marks the end of the SC era since libraries, desktop and applications are now in a separate release schedule. Also, if you are at akademy we're having a short session Sunday at 10:40, and I guess i'll schedule a BoF later in the week. Are you guys going to release Plasma 5/KF5 and KDE Applications separately? Or will KDE Applications once ready will be released along the 5.x.y or 5.x+1? I don't even anymore know what is released, what is stable, what is for developers, what is for consumers, what is for early adopters etc. The whole "KDE 5" release has been a CATASTROPHE. Reading almost daily PlanetKDE and I can not tell anything to anyone what is the status of "KDE 5"
Now I am in believe that "KDE 5.1" is the version what is under work and it is the first release what works and is meant for early adopters and then maybe 5.1 or at least 5.2 is then for consumers. Now the real problem has been that the "framework" means "#!"¤! to users. It was much better long time ago when it was just "KDE" and no playing with words or definitions. It was the software, it was the community produced and it was everything. Now KDE (community) has made same problems as Microsoft, they hired (or listened) marketing people next to designers (instead usability researchers) and branding has gone pieces. Someone needs to make a front page clear informative short worded announcement what is the version consumers are meant to wait and when it will be out. Same as what Fri13 said...!!! If you read the blog again I think it's pretty clear the schedules are decoupled. There's no such thing as KDE 5, read the blog again it explains the three components. You don't know what frameworks is? Cool, you're not supposed to care, that's development material. KDE Applications is easy, latest is best. Plasma 5 is user ready, may have some features less than Plasma 4 but unless you try it you can't know if it suits your needs. Thanks for the information, Albert, a very nice and clear summary. Awesome- thanks for the very clear and descriptive information. I think people who find this confusing should also find the existing approach fairly confusing. The components are very similar in nature, but simply release at different times and have less interdependency. If it were a house, Frameworks would be the foundation, Plasma would be the structure with the floors and rooms (what most common people would identify as 'the house'), and the applications would be the furniture and appliances that make the house useful. Maybe not the best analogy, but it displays the kind of cohesion at play- it's not really much more confusing than it ever has been. In fact, GNOME has a very similar structure. I think the main issue is whether people should say, "the new KDE looks awesome," or "Plasma 5 looks awesome." Personally, I've taken to just referring to Plasma since that's the most critical user-facing piece of it. KDE is the community, not what you use, from what I understand. The supposed confusion about naming or versions is very likely just cheap trolling. If we look at one of the most used ecosystems, Microsoft's Windows, which has the workspace product "Windows" at version 8.1, a browser product "Internet Explorer" at 11, a office product called "Office" at 2013 and a development framework called ".NET" at 4.5, do we see tons of complains of why this is so much more complicated than calling everything "Microsoft 8"? Are users of Microsoft products so much more capable of understanding that different products have different names, different versions and even different version schemas? I got confused because of the linear flow and too much K-jargon. Here is the summary. There is no confusion anymore. KDE Frameworks (previously KDE Platform) - both features and bugfixes every month. Plasma Desktop (previously KDE Workspace) - bugfixes monthly & feature every 3 months. KDE Applications - bugfixes every 3 months & feature every 4 months. Someone once mentioned the idea of a "release day" when applications (and Plasma) could make releases together, to attract more publicity (like SC releases have done so far). That sounds like good idea to me. please bring back KDE 5. If you take a look in any forum of any distro you'll see that nobody uses this new jargon. KDE 5 is so easy and straightforward, why are you overcomplicating things like this? "please bring back KDE 5." There's never been such thing as KDE 5, it can't be brought back. "why are you overcomplicating things like this?" 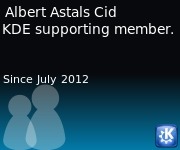 Thanks for your blog and your ongoing efford to communicate KDE's development scheme. I understand your reasons but personally I will stick to use KDE 5 once I will start using the new stuff as I never used KDE SC. Where can we find KDE Applications move to Qt5 and KF5 status ?